Ergonomic pen is designed to deter theft, resist tampering and stand up to daily abuse. Flexible, 23" nylon-coated aircraft cable secures pen to base. Sturdy, aluminum base mounts easily with double-backed adhesive or with hidden screw. 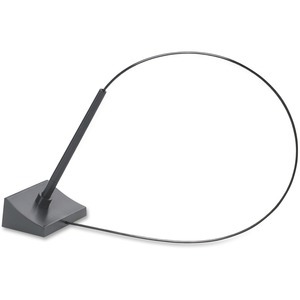 Designed to stay put, the Kable pen's cable cannot be severed with ordinary tools. Unique locking feature discourages dismantling yet easily unlocks to change refill. Tapered barrel is made of durable anodized aluminum. Pen uses MMF Industries Jumbo Jogger refills.